Isn’t this a great looking bag? I love the colors and the iconic flower from EccoBella. The EccoBella boat tote is very roomy and perfect for taking with you to work, shopping, beach or vacation. The handles are reinforced and sewn to the base for extra strength. It is made of organic cotton and is super roomy and durable! I love using my bag to bring things back and forth to work. I carry my lunch in my tote along with a sweater, a book or two. There is a front pack which you could use for your EccoBella makeup, cell phone or security card to get into work. There is also a inside zipper pocket for your valuables. I keep a spare key for my car and house in that pocket. I wonder how I got along without this fabulous tote! 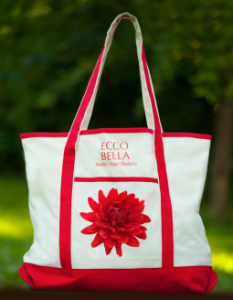 If you would like to purchase your own limited addition EccoBella Boat Tote you can do so HERE. While you are there make sure to take a look at all the other beauty products!